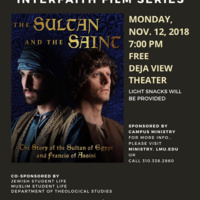 Interfaith Film Series: "The Sultan and the Saint"
This free event for LMU students is sponsored by LMU Campus Ministry. Includes commentary and discussion. Light snacks will be provided.